During times of persecution Christians have always managed to embrace compromise and accommodation, leaving martyrdom to the few. At the very beginning Christians would honour the emperor at pagan altars seeing nothing in it. In the dark days of the reformation parsons would outwardly conform to Mrs Cramner’s little book whilst still mumbling the Mass. Today we must be similarly armed. Attending church today can be painful, with enthusiastic clergy, warm churches and hugs at the sign of peace. Affirming Laudianism offers the following armoury for divine worship. 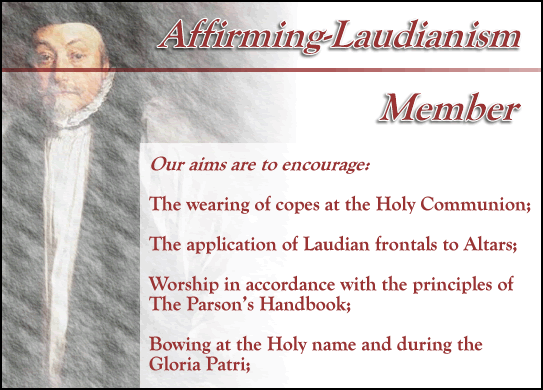 To join Affirming Laudianism one simply has to affirm our principle aims on this simple print cut out and keep membership card. Having saved the card to your hard drive open it with Windows Image view, select print, and choose Wallet Prints. Taking headphones, or even your grandchildren’s Ipod into church can be a very useful way of blocking out Graham Kendrick and other grating choruses. Simply turn on out cassette and you have your own service music. Hymns are joined by recordings of services you can happily listen to as you sit in the service: extracts include the funeral sentences from the funeral of Her Majesty Queen Elizabeth The Queen Mother; the national anthem from the State Funeral of Earl Mountbatten of Burma; the sung preface from the Coronation of Her Majesty The Queen sung by Dr Geoffrey Fisher. Incidental music is taken from the service of blessing of the marriage of The Prince of Whales and Mrs Parker-Bowles. Newer and heated churches are rarely damp and OHPs have in many places eliminated the smell of old hymn books, let alone old BCPs. Our church smell spray has been formulated by top chemists from damp, old hassocks, dust and mice droppings. Simply sit in your pew and spray it on to your Sunday best. When you return home your loved ones will really know you’ve been to church. It can no longer be guaranteed to find a clergyman properly dressed, or indeed find a clergy man at divine worship. Affirming Laudianism is able to offer ‘Instant robes’ for any occasion. Robes are printed on a card with a hole for the face of the priest, simply hold up the card aligning the hole with the priest’s face and the illusion is that he or she is properly vested. Cards include: scarf and hood with bands, chasuble and alb, surplice and stole and cassock, gown and bands. There is also an option of a card with a beard to disguise female clergy, or indeed when you are unsure of gender.